In September of 1960, John Steinbeck and his poodle Charley traveled across America, driving through small towns, cities and wilderness areas. In his book, Travels with Charley: In Search of America, he talks about how peoples’ lives are changing and connects this to his observations of the natural world. And he listens to people. Really listens. He notes their interactions, their rhythms of speech, and their regional accents. He argues that these regional accents are disappearing. He says that the food is bland—clean and safe, but boring. I do not dispute his experiences, especially since I have not traveled as widely across this country as he did. But I do travel deeply. 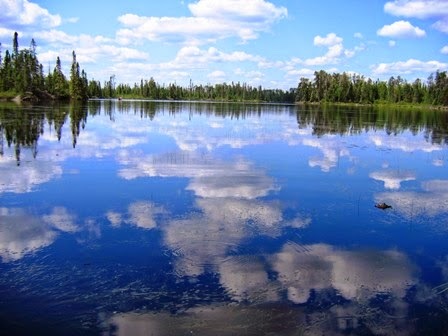 Every summer I spend five weeks in the Northwoods of Minnesota, right on the boundary waters. And my experience of Minnesota has been anything but bland or boring. I look forward all year to July—to taste the walleye fresh out of Larch Lake and the service berry pies my husband makes as soon as he can gather them from the bushes outside our cabin. I look forward to the sounds of the loons in the late evenings and again in the early mornings. I look forward to the Gunflint Lake Canoe Races, the Fisherman’s Picnic and the view of Lake Superior from the patio of the Dockside Fish and Seafood Market or The Angry Trout Cafe. And as much as anything, I love the sound of the regional dialect. But then, I have always loved language—the sound of it as well as the magic it can create. What writer doesn’t? I love listening to the elongated vowels, especially the “O's.” Many people will use “V” in place of “W” turning "Well" into "Vell.” The speech has a musical lilt, which contributes to the reputation of the people as open and friendly. What about you? Are you an observer? I am an observer, like you. "I love the sound of the regional dialect. But then, I have always loved language—the sound of it as well as the magic it can create ->>>"
Never pack away your traveling shoes! I have to admit, I am completely jealous of your cabin in Minnesota. I have family and even a few friends in Minnesota and though I don't make it there often enough, I have an unusual love affair with the place Having a lake cabin in the north woods of Minnesota is a long time romantic fantasy of mine. I hope I am an observer. I have been thinking about that question recently. I think I am a keener observer of human behavior than I am of place. It's something I have to work on in my writing and I do find it a bit intimidating. Thanks for the post!